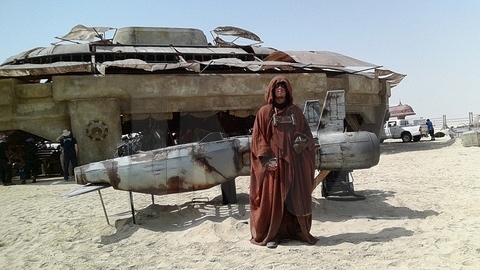 Spoilers: Constructing the opening sequences of Star Wars: Episode VII! We’ve seen more than we thought! 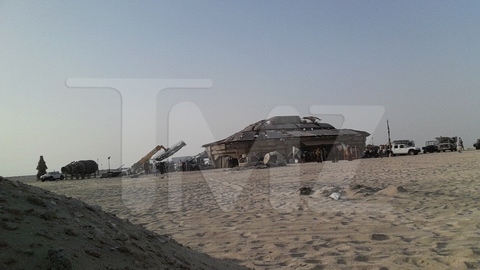 After looking at lots of art from Star Wars: Episode VII conducted for the Abu Dhabi shoot, some of the events from the opening of the film are becoming a little clearer. What is surprising is how much we have already seen in other places. John Boyega’s Star Wars: Episode VII costume was kind of revealed to us. 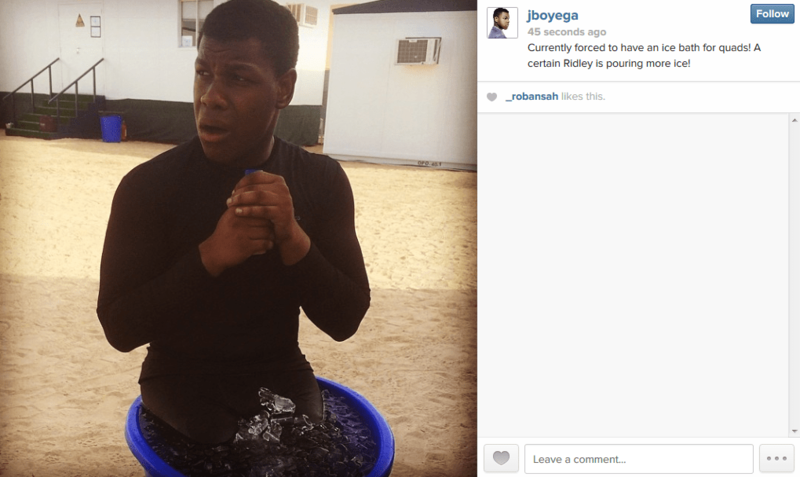 You might recall we posted a photo from John Boyega’s Instagram where he’s soaking his quads while Daisy Ridley gets him more ice. I was skeptical of this reveal back then because it was so basic. But now I think it actually adds up, maybe. I asked someone in the know about the costumes sometime ago and I was told the “costume evolves.” I was annoyed with the answer but I understood. Since that time we have learned that Boyega’s character is probably a Special Forces Stormtrooper/TIE Fighter pilot. There is evidence to suggest he crashes and Ridely’s character saves him. Apparently the Special Forces TIE Fighter is shot down. Almost immediately, scavengers come down on the location. They do not look friendly. They ride mechanical mounts. They’re about the size of a buffalo with a small AT-ST styled head, guns in the same location, but with 4 mini AT-AT legs. Its pretty much a one person AT-AT and they ride them like horses. The riders look like the people we saw as extras in the TMZ photos but two of them have saucer hats, sort of like Embo from The Clone Wars. 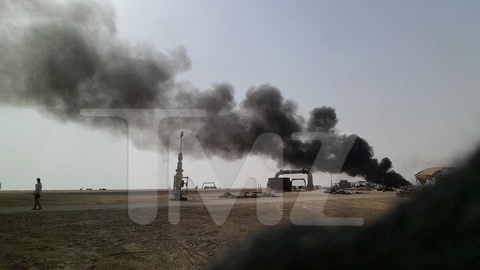 Speculation: Most likely, Daisy Ridley’s character is flying her quad engined ship near the outpost and shoots at the scavengers (which would explain the reports from extras they were being shot at from the air and were told to run). She probably lands the ship and her smaller transport comes out the back of the shuttle. She and her droid make for the injured pilot. Yes, that’s right. That’s the speeder the girl flies, the little droid rides in, and the man in a black leotard lays unconscious in. So to reiterate, the Special Forces TIE Fighter crashes. Most likely, Boyega’s character is pulled from the burning wreckage by Ridley’s character. She removes the excess armor from his body. She puts him into the speeder seen in the TMZ photos and heads for the “TMZ” location. I presume she plans to get Boyega’s character medical attention. Interestingly, the Falcon and the silver and blue X-wing are parked at this location in concept art. The photo above is a cantina type environment. Erik Tiemens did a really fantastic piece of art showing the inside of the location while “Kira” stands at the doorway looking in. Could this be where she meets the pilot of the Falcon?I believe this is the location she meets with Max von Sydow’s cyborg character as well. Questions arise from this: Was she sent here to retrieve Boyega’s character and we learn why in the opening crawl? Do they just happen to run into the new owner of the Falcon and arrange transport off the planet? Why does she want to help him? I hope this wasn’t too hard to follow and you enjoyed examining what these locations and props might mean.